Get tickets to see Motorama at the Brown County Arena and Shopko Hall! 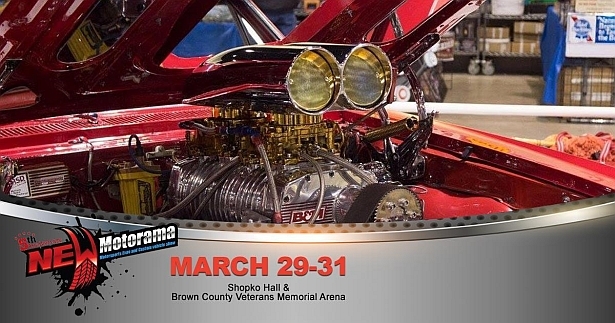 The area’s premier motorsports expo and custom car show is coming to the Brown County Arena and Shopko Hall March 29-31. The 5th annual Northeast Wisconsin (NEW) Motorama will feature a special display of modern and vintage muscle cars, displays and entertainment! Hours are Friday 3 p.m. – 10 p.m., Saturday 10 a.m. – 9 p.m. and Sunday 10 a.m. – 5 p.m.
Tickets are on sale right now at Reschcenter.com at just $10 for adult general admission, $20 for a weekend pass and kids 5-12 get in for only $6! Also make sure to tune in on 103-FXD because we’ve got ten tickets, which means ten opportunities for you to go to Motorama on us!